Holiday spirit is in full swing over here at Natural + Nourished! It's been nonstop streaming of Christmas music, Love Actually and Elf playing on repeat in the background, and lots of holiday inspired cooking and baking. Although I always think summer is my favorite season, there is certainly magic in the air this time of year that I just adore. My husband and I are hosting the first candle lighting for Hanukkah this Sunday so I have been experimenting with different recipes for the occasion. This essentially translates to eating latkes for dinner almost every night for the last two weeks. Though I have been making healthier versions made with grain/gluten-free flour and fried in coconut oil, fried potatoes are fried potatoes, any way you slice (err shred?) it. To make up for all of this gluttony, I have been more conscientious about my breakfast and lunch choices and opting for more protein and veggie filled meals during the day. One of my favorite ways to incorporate more veggies and to reduce carb intake is making wraps using collard greens. These amazingly simple collard wraps have been saving my tushie, literally. Collards do a truly impressive job at holding up as wraps. The leaves are sturdy and thick, yet flexible enough to roll up. Also, they don't get soggy, which allows you to pack them and take them on the go. Nutritious, delicious, and convenient? Triple threat, baby! These wraps can be filled with almost any mix of vegetables, grains, and proteins. I do recommend using some sort of spread like hummus, tahini, or cashew cheese because it helps to hold the filling together. The spreads add an extra boost of fiber and healthy fats to balance out the overall macros of the wrap, too! Start by thoroughly washing your collards. Some recipes suggest steaming the greens, but I prefer raw as the greens maintain better texture with a nice crunch. Also, skipping an entire cooking step? Yes, please! 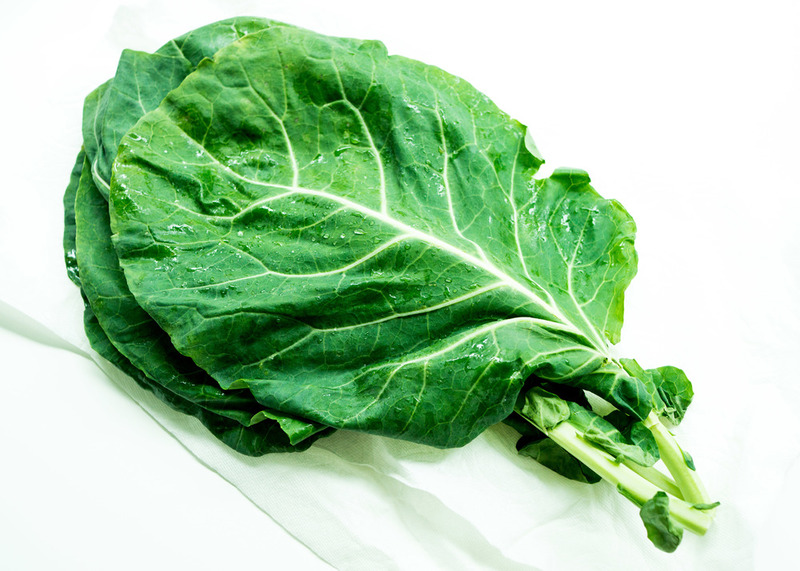 Dry off the collards with a towel to remove any moisture. Remove the white stalk at the end of the large collard leaf. Then, using a sharp paring knife, trim down the dense stalk on the leaf until it is nearly the same thickness as the leaf. Be careful not to cut through the leaf. It's okay if some parts of the stalk remain a bit thicker - it may get in the way of rolling, but it's not a big deal. Place two collard leaves on a cutting board with the leaves partially overlapping and stems pointed at opposite ends. Prior to adding the fillings, I like to mix together the hummus (or any other spread) with the quinoa, carrots, and any other smaller vegetables to bind those ingredients together and keep the smaller components from spilling out of the wrap. After mixing, stack your spread, other larger veggies, and proteins in the middle of the leaves, leaving a good few inches around the edges. Then, wrap like a burrito by folding in the sides and rolling from bottom to top. Cut in half and enjoy! Thoroughly wash collard leaves. Pat dry with a towel. Remove the white stalks at the stem of the leaves. Using a paring knife, trim down the dense stalk on the leaf until the stalk is nearly the same thickness as the leaf. Stack the two leaves horizontally with about half of the leaves overlapping and the stems pointed at opposite ends. Mix together hummus, quinoa, and shredded carrots. Spread hummus mixture on the middle of the leaves, leaving a few inches for wrapping around the edges. Stack the remaining ingredients on hummus mixture. Fold in the sides of the collard leaves. 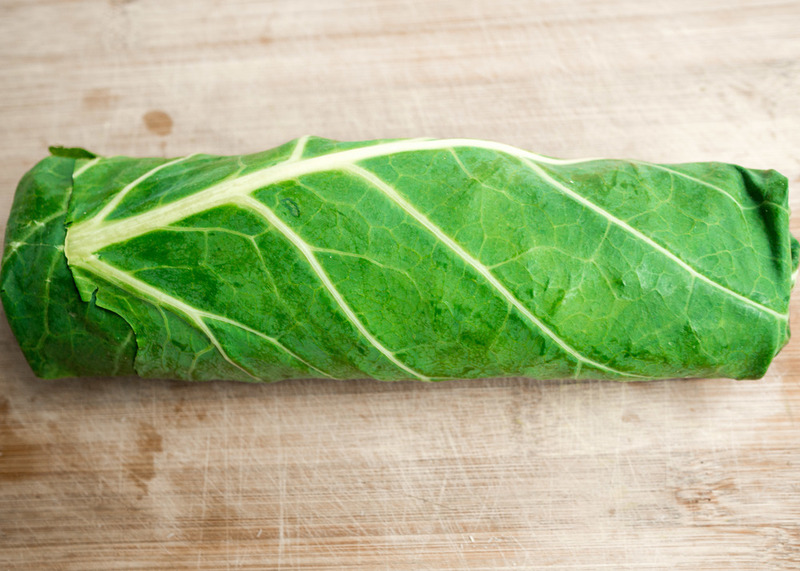 Fold up the bottom collard leafand wrap like a burrito. Cut in half and enjoy!